COTS for the Moon, it apprears the balloon has gone up. Bridenstine didn't waste any time. There are several small lunar landers getting ready to fly, but Blue Origin's Blue Moon lander is said to be good for 4 metric tons of cargo and SpaceX's BFS spaceship will be a monster. Wow, this could be a serious program! I hope the likes of SpaceX/Blue Origin/Bigelow/etc won't get to snowed under by the money hungry old space giants with their 40 years old tin-can tech! Sounds like a one-stop BFS services shop would fit right in. Please be informed that it is anticipated the Draft Request for Proposal (DRFP) for CLPS will be posted in late April and available for comment for 30 days. In addition to the DRFP posting, there will be an Industry Day held at NASA Headquarters, 300 E. Street, Washington, DC 20546 in the Auditorium on May 8, 2018. The event will be held from 8:30 am to 4:00 pm and access to the auditorium will be available beginning at 8:00 am. One on one meetings for 15-minute time slots are available for potential offerors to meet the Contracting Officer and technical team. If your company is interested in participating in the one on one meetings, you can notify Theresa A. Stevens, Contracting Officer at theresa.a.stevens@nasa.gov to schedule an appointment time. All question and answers presented at Industry Day will be posted out on the CLPS E-library. 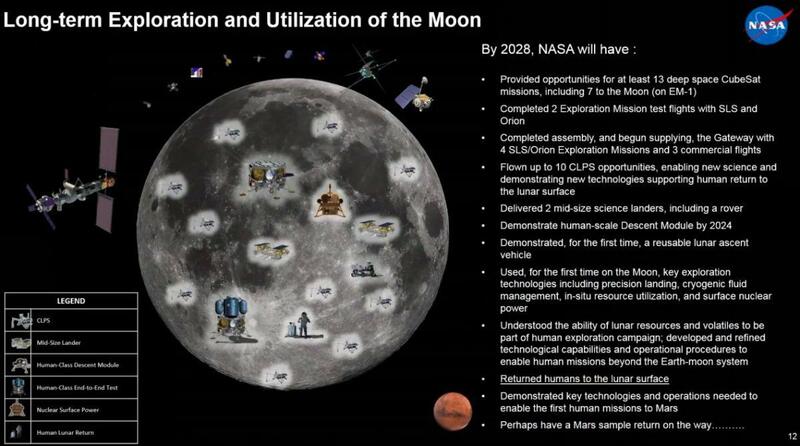 This Special Notice Synopsis for Commercial Lunar Payload Services (CLPS) procurement is to publicize less than full and open competition; and that NASA will be limiting sources pursuant to 10 U.S.C. 2304(c)(3), as implemented by Federal Acquisition Regulation (FAR) 6.302-3(b)(1)(v). NASA has determined that creating or maintaining required domestic capabilities for production of critical space transportation services and vehicles to perform those services by limiting competition to capabilities manufactured in the United States or its outlying areas by domestically-owned and controlled entities is consistent with and necessary to implement United States space policy. Space policy mandates, when read in concert, require NASA to promote, support, and maintain a domestic industrial base of space transportation capabilities to the lunar surface. In order to fulfill these mandates, CLPS space transportation service provider prime contractors, as well as all firms that construct, produce, manufacture or otherwise provide space transportation vehicles for the purpose of the prime contractor's performance of CLPS must qualify as domestically owned and controlled as defined by the CLPS solicitation. Additionally, all CLPS space transportation service provider prime contractors shall provide a CLPS that utilizes domestic end products for all space transportation vehicles required for performance of this contract, inclusive of any launch vehicle and any other space transportation vehicle used to deliver payloads to the lunar surface. The cost of each component includes transportation costs to the place of incorporation into the CLPS and any applicable duty (whether or not a duty - free entry certificate is issued). NASA's intent is to limit sources for the CLPS procurement for the purposes of industrial mobilization. NASA is not requesting that any capabilities or information be submitted by Industry. Market research has been conducted and completed. However, comments from Industry on less than full and open competition must be submitted within 15 days of this posting and NLT August 18, 2018 at 2:00 p.m.
WASHINGTON -- As NASA evaluates proposals for commercially developed small lunar landers, the agency is now seeking payloads that could fly on those spacecraft despite concerns from some scientists that they don’t know if their experiments are compatible with those landers. NASA released Oct. 18 a formal solicitation for "Lunar Surface Instrument and Technology Payloads" that seeks experiments for flight on lander missions procured by the agency's Commercial Lunar Payload Services (CLPS) program. NASA plans to select 8 to 12 experiments next year for launch no earlier than 2020, with an overall budget of between $24 and 36 million in the first year of the program. Moon Express website...neat Rocket lab venture shown. Under a program called Commercial Lunar Payload Services (CLPS), NASA would buy space aboard a couple of launches a year, starting in 2021. The effort is similar to an agency program that paid private space companies such as Elon Musk's SpaceX to deliver cargo to the International Space Station (ISS). "This a new way of doing business," says Sarah Noble, a planetary scientist at NASA headquarters in Washington, D.C., who is leading the science side of NASA's lunar plans. Scientists are lining up for a ride. "It really feels like the future of lunar exploration," says Erica Jawin, a planetary scientist at the Smithsonian Institution's National Museum of Natural History in Washington, D.C. She and other attendees at the annual meeting of the Lunar Exploration Analysis Group in Columbia, Maryland, last week were eager to show NASA why their small experiments would be worthy hitchhikers on the landers.